and baby massage techniques that can help! Baby massage for colic is given to infants who cry often and seem as if they are in excruciating pain. It involves a series of specific movements, followed by massage on the abdominal muscles to help ease pain and crying. This condition can cause a baby to cry for three hours or more per day for the first three months of life. Typically, the crying will start at the same time each day. Always consult your doctor if your baby has long periods of crying. It could be something much more serious. The cause of this condition in babies is not known, but studies show that almost 1/3 of all babies have the disorder. Studies also show that there may be different causes for each different baby. Some physicians speculate that it is caused by gas in babies or food sensitivities. Others believe it is due to immature digestive tract development. 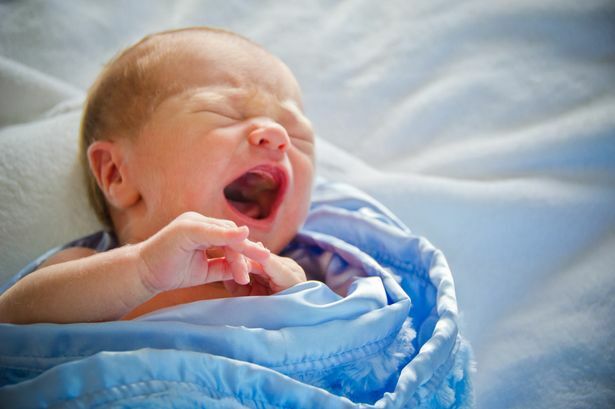 Babies usually experience episodes of pain during the first three months after birth. Usually, by the end of the 4th month after birth, it disappears. Outside of creating a strong bond with your baby, this treatment can help ease pain and relax abdominal muscles, which also causes the colic to disappear faster and appear less often. Massage helps to aid digestion and circulation in the stomach so that trapped gas and any other digestive issues can be encouraged to move, so it is important that parents learn how to deal with colic. Usually, the baby is just wearing a diaper and is laid on his/her back. This may not be possible during a crying episode because the baby may be in too much pain. You may have to wait until bath time. With about a teaspoon of baby oil (any natural oil can be used - almond, olive, grapeseed ) rub your hands together to warm the oil. Gently begin to rub baby's tummy with your fingers pointed toward the chin and moving in a downward direction toward the waist area. With a "doggie-paddle" type motion, rub from top of stomach to waist area for 5 -10 times with gentle, firm pressure. Next, gently bend the baby's legs where the thighs are touching the belly. Move your hands to baby's ankles and slowly straighten the legs, then move back to where thighs are touching belly again. Do the repetitions 5-7 times. Now, place your palm and fingers on baby's belly. Massage in a light, gentle, clockwise circular position for about 2 minutes. This should aid your baby in passing gas and he/she should feel much better. This DVD, Massage Practice for Infants by Michelle Kluck, LMT will help you learn at home how to massage a baby with gas/stomach pain, but it also shows how to give a massage to baby for chest congestion, nasal congestion, constipation, and other issues that new parents face with newborn babies. Learn step-by-step massage instructions for babies with this disorder at Huggies.com. Nurses, massage therapists, and many other health care providers, as well as mothers and fathers, are choosing to learn safe massage techniques on how to give a massage to infants for colic to help baby relax and sleep.